Does The Internet Affect Creative Thought? affected how we think creatively? I recently finished reading a compilation of scientific studies on this subject. Some scientists say No, and others say Yes, without any definitive coalescing of ideas on this subject. But the subject is intriguing, nonetheless. As a Jewelry Designer, do we think through our projects and our artistic lives differently today, than say, we would have 20 years ago before the Internet? Has the Internet changed your way of thinking as a Jewelry Designer? Supposedly out attention spans are shorter, and we expect things to come to us in smaller bits or packages. Do we find, as a Jewelry Designer, it getting more difficult to stay focused on one thing, one theme, one technique, for too long before bopping off to something else? Have our projects become simpler, less embellished, more dependent on a spectacular clasp or a particular gemstone, to the detriment of other “design” possibilities within the rest of the piece? Or have we learned to be more “liquid” in our thinking, able to take in more facts, more ideas, and organize these more coherently? Do our Jewelry Designs emerge from greater control over more ideas, and ideas coming and changing faster? Is this more intricate complexity? Are we more able to incorporate ideas cross-culturally and cross-nationally? Are we able to design more, for more? The Internet is a chaotic collection of boundless information. Are we too aware of too many styles, materials, techniques, fashions, trends? Is our ability to draw with billions of colors on a computer screen paralyzing when it comes to choosing among the more restrictive colors of available beads? Do we seem to end up with more unfinished projects, because we don’t have enough time to start the next new idea, if we finished? Do we end up buying too many materials and too many types of materials because we’re less and less sure what will be relevant when, and because we keep findings out about new materials and new techniques and new fun things to do and with which to experiment? Do we too often try to mix media within our pieces, to the success of none of the different types of materials? Does all this information become paralyzing to the extent that it halts us from working on our designing and making? Or, do our designs seem more coherent, more integrated, sexier because we have more information available to make us think, keep us aware, help us integrate complex ideas? Are we more willing to do and more successful in doing multi-media projects? Does mastery over more ideas make us feel more powerful, more motivated, more experimental? We spend more and more time socially interacting on-line. Do you find spending time on emails, message boards, forums, facebook, twitter and the like is time you could have spent on designing and making jewelry? Is a lot of this time redundant, goal-less, wasteful? Does time spent with these online social networks end up pulling you in even more directions, than if you were not so socially connected? Or, does the time spent here help you design better, or help you sell your pieces better, or make you a better consumer of the parts you use in your pieces? Do you feel you can problem-solve faster with this broader access to more people and more frequently? Does this broader access help you narrow down your choices to a manageable few? We are used to getting information in small bits, scanning tons of information briefly and superficially, and making choices based on insufficient information — no analysis, no indepth questioning, in very disconnected ways. Are you less interested in finding meaning, history, depth in the designs, techniques or materials that you use? Are your designs becoming more simple or straightforward or less challenging? Do you care less about your pieces beyond following a set of steps and completing your projects? Do you feel that the title “Jewelry Designer” has less credibility, less currency, less status, less importance relative to your work designing jewelry? Do you think less about the place of your jewelry in the world? Is it less important that your jewelry resonate with feeling, or impact people’s lives? Are you less interested in references from the vintage or traditional past, and overly concerned with the “hot” idea of the moment? Or, do you feel more forced or encouraged to try more difficult and challenging designs? Does the Internet make you ask more questions of your work and find more relevant information – history, culture, personality, fashion – and the like? Are you more likely to contemporize traditional designs, revitalize vintage pieces, or adapt traditional techniques? The Internet gives us a sense of power and place, but it is very fleeting. Do you feel more important, more established, more credible because you have your own website or are selling on Etsy? But do you, at the same time, feel this confidence and credibility is more fragile, more easily challenged, more here today and gone tomorrow? Does selling your pieces on line make you feel stronger, more powerful, more relevant than selling your pieces in a local store? But at the same time, does selling on line make you feel more vulnerable, less established, more easily and likely to be challenged by many people around the world? Or, do you see the Internet as opening up new markets for yourself that you can conquer, ad infinitum? Has it motivated you to do things where before you felt stuck or afraid? The speed of information on the Internet is much faster than the ebb and flow of information and time around you. So do you feel, in today’s world, it is much more difficult to keep up? Do fashions, styles and techniques change faster than you can adapt to these changes? Do you feel your competitive market getting further and further from you, at a faster and faster pace? 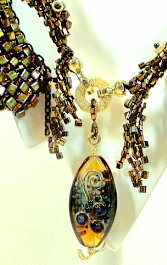 Do you feel your Jewelry Designs, and your strategies for selling these designs, become “yesterdays” all too quickly? Or, does the rapid pace of the Internet, somehow set a more rapid, directed pace for yourself? Do you see more possibilities, and feel more motivated to keep up with them? Do you see time as a challenge, and go for it? When we see the term “hyperlinked”, are we more apt to focus on the “linked”, rather than the “hyper”? The Internet may make it seem that the framework for good jewelry design is somehow larger. The information more extensive. And changing. Very rapidly. There seem to be fewer clues on how to weed through all this information, to reject what is irrelevant or unnecessary. It feels too easy to get caught up in this ever-speeding-up whirlwind of stuff. The Good Jewelry Designer will continue to learn the fundamentals and make choices accordingly. We always want to let in the environmental influences around us. But these influences still need to be managed. As always. This entry was posted on January 10, 2010 at 2:37 am	and is filed under jewelry design. Tagged: creative thinking, internet, internet and jewelry design, internet influences on thought, jewelry design, thinking creatively. You can follow any responses to this entry through the RSS 2.0 feed. You can leave a response, or trackback from your own site.